Richard C. Crain recently completed tenure as Director of Instrumental Studies at Houston Baptist University and serves as the Orchestra Director at Spring Baptist Church. He previously spent 21 years as Director of Music for the Spring Independent School District near Houston, Texas. He also served as Head Band Director at Westfield High School, Spring High School, and Belton High School. His bands performed at The Midwest Clinic (1980) and in the Tournament of Roses Parade (1974) and won honors in concert and marching contests in Texas, Louisiana, Virginia, and Colorado. 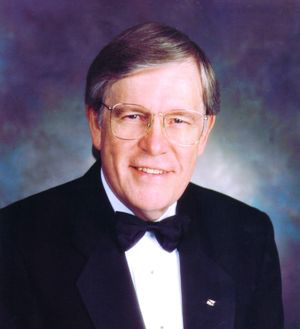 In 2000, Crain retired from public school music education after 44 years of service. He is a frequent adjudicator, clinician, and consultant throughout the US; and he has been a presenter for numerous university summer band camps, music education classes, and state music conventions throughout the US and Canada. Crain lives in The Woodlands, Texas, and his three sons, successful businessmen in nearby Houston, are Scott, with wife Jennifer and children Lauren, Emily, and Joshua; Chris, with wife Melissa and children Jacob and Caroline; and Steven.